The WebBridge LR link resolver is not available in Google Scholar at this time. We have reported the issue and will update when we have more information. If you need assistance retrieving articles from Google Scholar or any other database, please contact us. The WebBridge LR link resolver is working again in Scopus. The provider of that database was able to find a fix for the issue. If you need assistance with Scopus, the link resolver, or any other Library resources, please contact us. After many, many months of not working correctly, we are happy to report that the WebBridge Link Resolver is once again available for PubMed. As our most-used database, we are relieved to offer this service to all of you after such a long absence. If you would like a refresher or an introduction to how the link resolver works in PubMed, you can refer to this earlier post. Additionally, if you’d like to set up your My NCBI account to display the link resolver icon, please see this walkthrough. For those who want to know more about the WebBridge Link Resolver, this LibGuide is made just for you. Need any more information or assistance? We’re always available to help. The link resolver being used for PubMed is once again working correctly. If you need assistance with any Library resources, please contact us. This temporary option uses the coverage information from our E-Journals & E-Books A to Z List. Although it covers many of the journals we receive, it does not include all of our subscribed titles nor our print holdings. Regardless of whether an online source is found for the article, each page will provide a link to the Library’s Catalog so that you can also check there to see if we have that particular journal in print or online. We are still hoping for a fix so that we can return to using the WebBridge Link Resolver in PubMed, and we apologize for any troubles this temporary change in service has and continues to cause. If you need assistance with this or any other Library resources, please do not hesitate to contact us. We hope this new interim option will be of help to better get you to the articles you need when searching PubMed. Once the problem is rectified, we will return to using the WebBridge Link Resolver for PubMed, but we currently do not know when that will happen. Additionally, the WebBridge Link Resolver continues to be used for all other Library databases where it is presently available. If you need assistance with this or any other Library resources, please do not hesitate to contact us. Unfortunately, there is no data being sent from PubMed to our link resolver’s system, so you will be unable to check whether the Library has access to an article from PubMed for the foreseeable future. The issue is currently being investigated, but there is no estimate as to when we might have a solution. In the interim, when you find an article you need you can check whether the Library has access to that journal via INNOPAC, the Library’s online catalog or the E-Journals & E-Books A to Z List. 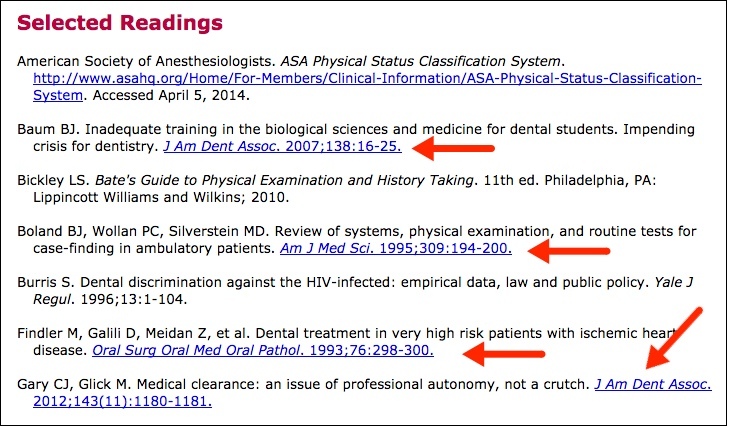 Links to those sources are now provided when you click the “Check Full Text” icon in PubMed. We have also added options that allow you to search other databases with the PMID: the links displayed for Scopus and MEDLINE via EBSCOhost have the PMID added to provide a quick way to use the link resolver in these two databases to get to the article you originally searched in PubMed. A link is also provided to search MEDLINE through Ovid, and the link resolver is available in this database as well. We will update as soon as we have more information, but if you need more assistance please do not hesitate to contact us. Recently you may have noticed alerts on PubMed and all other NCBI sites regarding testing. This is to prepare all of their sites to permanently transition to HTTPS, but we have discovered that when this testing occurs it affects the ability to see results from the WebBridge Link Resolver, especially in PubMed. Unfortunately, there is nothing we can do to get the link resolver to work while NCBI is performing these tests, but there are alternatives to find out whether the Library has access to the article you need. You can check the journal’s title via INNOPAC, the Library’s online catalog. You can also use MEDLINE through Ovid or EBSCOhost; the link resolver is included in both of these databases and they are not affected by the testing that occurs in PubMed or other NCBI sites. If you are curious as to why the NCBI sites are changing to HTTPS, this site has all of the information. Additionally, if you need help with this or any other Library resources, please do not hesitate to contact us. If you need any more information on the WebBridge Link Resolver, be sure to check out this LibGuide. If you need assistance with these or any other Library resources, please do not hesitate to contact us. Every now and then there is a hiccup in the process by which information goes through a number of channels in order to get you to your article when using the WebBridge Link Resolver from many Library databases. If you’ve seen the dreaded “No DOI found” message, you’ve probably wondered where to go next. If you encounter the “DOI not found” error, just return to the link resolver result screen and click the alternate link to get to the journal or the publisher’s site. We hope that this will help alleviate some of the trouble that you have getting articles through the link resolver. 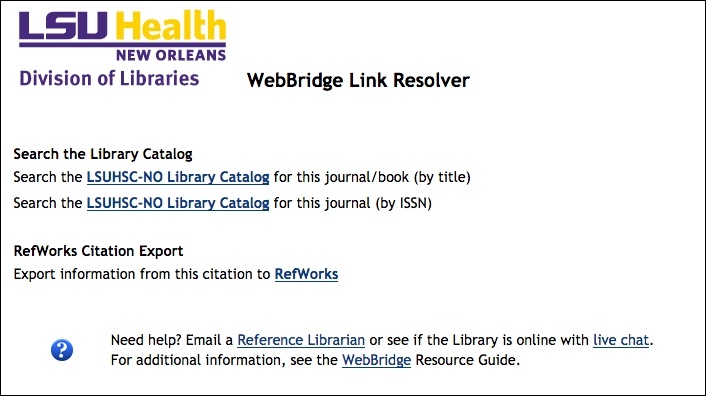 If you need more information about the WebBridge Link Resolver, check out our LibGuide. Also, if you need help with this or any other Library resources, please contact us. We are happy to report the WebBridge LR links are once again appearing in all EBSCOhost databases. If you need a refresher on how the link resolver works, this LibGuide will help. If you need any assistance with any Library resources, please contact us. If you do not find a match when clicking the link to check the Library catalog, you can search for the journal or book in the E-Books & E-Journals A to Z List to find whether it is available from another provider. The issue is being investigated but there is no timeline for when the problem will be fixed. If you need any assistance while this service is unavailable, please contact us. UPDATE: Links to resources and databases are now working correctly, but until the main problem is solved we might still experience difficulties. If so, please use the solution outlined below in the interim. Again, this only works on-campus. We’re investigating if this is related to the campus wide internet crash this morning and hope to have it resolved quickly. Thanks for your patience. The WebBridge Link Resolver is once again working correctly for Web of Science. We apologize for what was hopefully a slight interruption in the service, but please do not hesitate to contact us if you need any assistance.